So we went to that wedding. And my nephew was born (more about him later this week). But that wasn’t the end of the Portland trip. 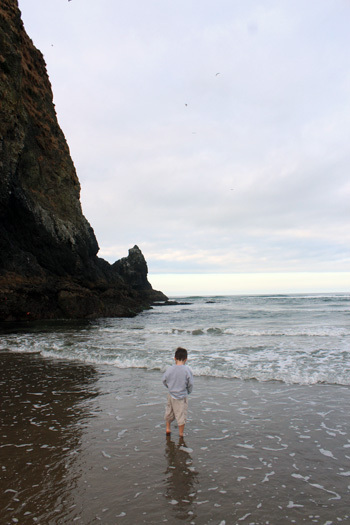 We stayed an extra couple of days to drive out to the coast and show the kids what the beach in Oregon is like. Step 1: Wake up Sunday morning earlyish. Step 2: Pack up everything from the world’s worst Portland rental house and drive two hours to Cannon beach. Step 3: Play on the beach all day Sunday. Step 4: Stay at beach hotel Sunday night and have dinner in beachy restaurant. Step 5: Get up Monday early and look at the tide pools around Haystack Rock. Step 6: Drive to the Tillamook Cheese Factory and go on a tour and enjoy all the cheesy factoriness of a cheese factory. Step 7: Head to the airport and fly home. Step 2: I packed up our stuff and got it all loaded into the car alone while Jason lay in the fetal position shivering and wondering what he had done to The Universe* to deserve this misery. Then I drove us two hours to Cannon Beach and asked Jason every three minutes if he wanted me to pull over so he could throw up because the idea of him throwing up in our rental car was too much for me to even consider. Step 3: The kids played on the chilly, cloudy beach while Jason lay in the fetal position on a beach towel, covered in a beach towel and tried not to throw up on the sand. Step 4: Jason took a scalding hot bath in an attempt to stop shivering and went to sleep in the one bedroom of our hotel room. I ordered the kids delivery pizza and we watched movies until they went to sleep in the living room area of the hotel room. After that I sat in the dark at the kitchen table (adjacent to the living room/kids sleeping area) and surfed the web and talked to Facebook. Eventually I ran out of wine and began to feel very sad about my current position in life (in the dark, alone, sick husband, WINELESS). Cash Register Girl: Oh yeah, are you staying at the Seaside Inn right there? Cash Register Girl (neither rudely nor with any sympathy for my situation): Yeah. I have two jobs. Me: Sorry… I swear I haven’t told this to every single person I’ve seen… Just you. Twice. Cash Register Girl: Sorry, we don’t take credit for under $5. Me: Oh, right. I can pay cash. If we’d actually been in a Wes Anderson movie, an episode of Portlandia or an Amy Sherman-Palladino show, then the next day the rental car would have hit a pothole and I would have had to swerve to narrowly miss running into a lady walking her three-legged cat on a leash and crashed into the town’s ancient and revered cherry tree and the tow-truck driver who would eventually come to get the car would have been that same Cashier/Hotel Check-in Girl. She would again be politely unsurprised and unamused. Step 5: But it wasn’t any of those, so we got up in the morning and Jason felt a little better. 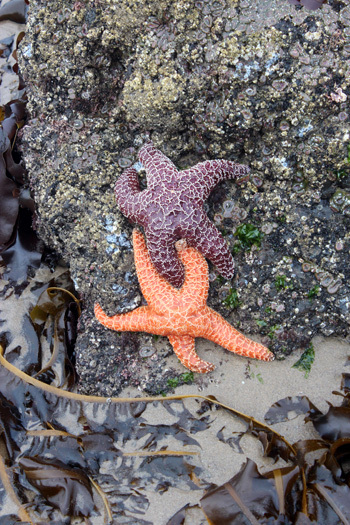 We did the tide pools, which were the best part of the beach. 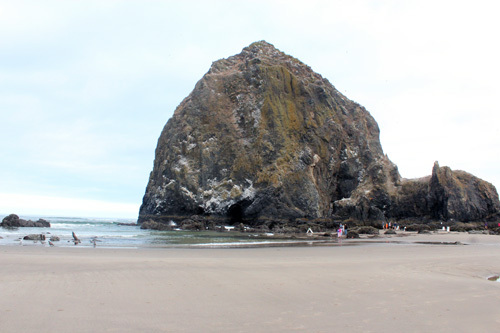 This is the Goonies rock. We didn't find any treasure. Jason made it look easy to navigate through the tidepools without falling down or squishing anything living. 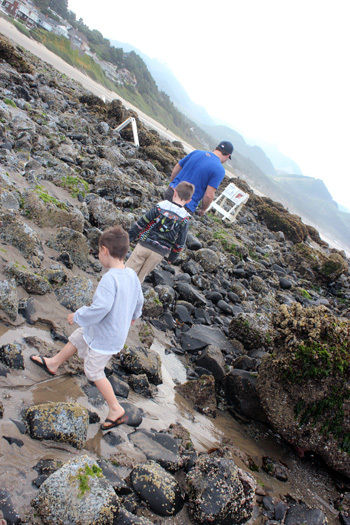 Jonas and I got stuck and had to be rescued by a professional tide-pool rescuer guy. Jonas didn't tell us he had to pee until he had to go so bad he was in tears and we were in the middle of tide pools roughly 30 minutes of walking through sand from a bathroom. So I told him to pee in the ocean. Instead he peed all over himself. Step 6: If you’re in Oregon and thinking about visiting the cheese factory, let me save you some time; instead, watch that show on the discovery channel “How Things Work” where they show factories all the time. Then go stand in the most crowded mall you know on a Saturday midday. It’s the same thing. Step 7: This one went as planned. One for seven, FTW! 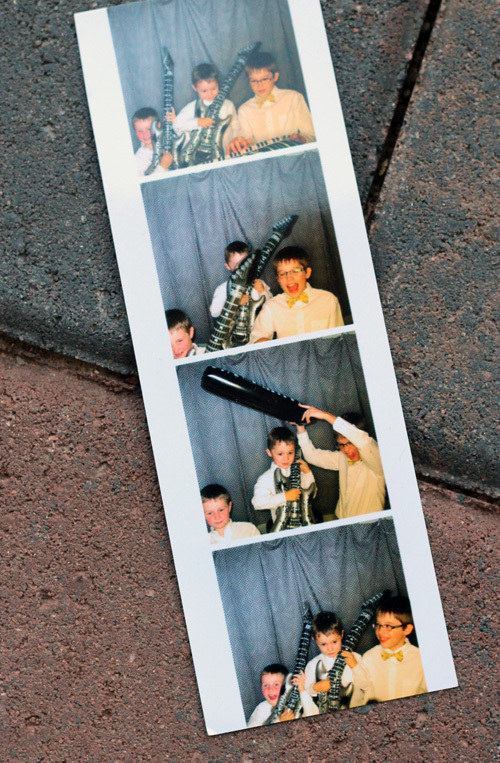 Bonus wedding photo booth shot I should have posted in Part I, but just found. They also did this by themselves. I think this is behavior I should totally encourage, right? We could call them Jonas's Brothers. Get it? You aren’t superstitious? Say what?